The Shapiro Family Charitable Foundation has pledged $2 million to The UCLA Foundation to fund two endowed chairs, both of which will greatly enhance the research, teaching, patient care and public service mission of the David Geffen School of Medicine at UCLA. The endowed Shapiro Family Chair in Child Development Studies and Cerebral Palsy, funded by a $1 million endowment, will support the teaching and research activities of a distinguished faculty member in the department of pediatrics who is dedicated to improving outcomes for children with developmental and behavioral problems. Examples would include working with children who have cerebral palsy, those who have parents with substance abuse problems and those who have experienced environmental deprivation. Studies will evaluate the developmental status of children from birth through 5 years of age in inpatient and outpatient settings. Presenting conditions may include high-risk status for developmental problems, as well as demonstrated delays in motor, cognitive, language and/or social-emotional development. The department is in the process of identifying a distinguished individual as chair holder. "The establishment of this chair will provide vital resources to promote innovative research and education in child development studies and cerebral palsy — and result in better treatments and programs for pediatric patients at Mattel Children's Hospital UCLA," said Dr. Edward R.B. McCabe, physician-in-chief of Mattel Children's Hospital UCLA and executive chair of the department of pediatrics at the David Geffen School of Medicine at UCLA. "We are grateful for this very generous gift from the Shapiro family." The Peter William Shapiro Chair for the Center for Cerebral Palsy will reside in the department of orthopaedic surgery at the Geffen School of Medicine. The creation of this chair supplies important resources to further promote and strengthen clinical services, professional and consumer education, and relevant research to meet the needs of people with cerebral palsy. William L. Oppenheim, director of the UCLA/Orthopaedic Hospital Center for Cerebral Palsy, said, "We at the Center for Cerebral Palsy are extremely grateful for Shirley, Ralph and Peter Shapiro's committed support to promote and enhance our teaching and clinical investigations, as they clearly understand our goal to emphasize ability over disability." Peter Shapiro is especially dedicated to this area of medicine and plays a key role in helping to underwrite the Center for Cerebral Palsy's programs. Eileen Fowler, the newly named holder of the chair, is the Center for Cerebral Palsy's director of research and education. She also is director of the Kameron Gait and Motion Analysis Laboratory and a faculty member at the Tarjan Center at UCLA, a University Center of Excellence. Fowler's research covers a variety of areas, including the effect of exercise and pharmacological agents on movement ability in persons with cerebral palsy and Duchenne muscular dystrophy. She was lead investigator of a multicenter study that demonstrated the benefits of exercise on strength, endurance and function in children with cerebral palsy. Fowler completed her physical therapy degree at Northeastern University in Boston, worked as a physical therapist at Orthopaedic Hospital in Los Angeles for five years and received her Ph.D. from the physiological science department (formerly kinesiology) at UCLA, with a major in biomechanics and a minor in motor control. She was the director of the UCLA Rehabilitation Department's Functional Assessment Laboratory before joining the department of orthopaedic surgery, where she is currently associate professor. Fowler was integral to the development of the Center for Cerebral Palsy. "The Shapiros' generous gift to UCLA's pediatric and orthopaedic programs will help lead to exciting breakthroughs in child development and cerebral palsy," said Dr. Gerald S. Levey, vice chancellor for UCLA Medical Sciences and dean of the David Geffen School of Medicine at UCLA. "We applaud their commitment to support the work of our dedicated researchers and improve the lives of both pediatric and adult patients in need of lifesaving medical treatments." Currently, Ralph Shapiro is chair of Avondale Investment Partners. He is on the board of advisors of the UCLA School of Law, is a member of the executive board for UCLA Medical Sciences, serves on the board of directors of The UCLA Foundation and is a member of the advisory board of the California NanoSystems Institute at UCLA. He also serves on the boards of directors of the United Cerebral Palsy Research and Education Foundation and the Spastic Children's Endowment Foundation and is a trustee of the Scripps Research Institute. Shapiro earned his bachelor's degree in business administration in 1953 and his J.D. in 1958, both from UCLA. He and his wife, Shirley, who received her bachelor's degree from UCLA in 1959, have three children. 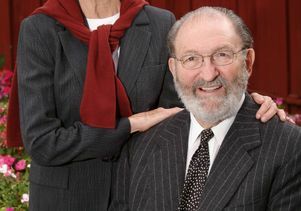 The Shapiros are the founders of the Shapiro Family Charitable Foundation, and their son Peter William Shapiro is the current president. Between the foundation, personal giving and associated entities, they are credited with more than $24 million in gifts to UCLA. Shirley Shapiro serves on the boards of directors of Women & Philanthropy and the Royce Center Circle and on the board of visitors of UCLA's School of the Arts and Architecture. A prominent campus landmark, the Shirley and Ralph Shapiro Fountain at the top of Janss Steps, was named in recognition of the couple's longstanding commitment to the university. Endowed chairs and professorships continue to play an increasingly crucial role in the recruitment and retention of outstanding university faculty. Reserved for the most distinguished scholars and teachers, including the best junior faculty, endowed chairs provide vital funds for the support of the chair holder's research, teaching and service activities. Donors continue to provide thoughtful and generous support for endowed chairs with the knowledge that their gifts supply a solid foundation for the enrichment of university programs and the recognition of academic excellence. The UCLA Department of Pediatrics was founded in 1950, and construction on the Marion Davies Children's Health Center was completed in 1962. Since that time, the pediatrics department has grown to include affiliations with Harbor–UCLA Medical Center, Martin Luther King Jr.–Harbor Hospital, Cedars–Sinai Medical Center and Olive View–UCLA Medical Center, and outpatient sites have expanded in the community. In 1998, UCLA's children's hospital was renamed Mattel Children's Hospital UCLA in recognition of a major gift by Mattel Inc. The UCLA Department of Orthopaedic Surgery provides consultation and treatment for disorders of the musculoskeletal system. Its faculty members provide comprehensive services for such specialties as joint replacement and reconstructive surgery, microvascular surgery, sports medicine, arthroscopy, foot and ankle surgery, hand surgery, pediatric orthopaedics, spinal diseases, orthopaedic trauma, orthopaedic oncology and metabolic bone disease. In 1998, UCLA and Los Angeles Orthopaedic Hospital formed a strategic alliance through which Orthopaedic Hospital was integrated with UCLA in the replacement facility for Santa Monica–UCLA Medical Center and Orthopaedic Hospital. For more information about UCLA's pediatric and orthopaedic surgery programs, please visit www.uclahealth.org.